First, we must begin with these guys! They are what Jim likes to call "Two pugs in a pod" I just wanted to show this to you to make you go "Oh How Cute!". I know that's what you're saying! I am coming back to New York today because we headed back to NYC again to get the rest of Jim's belongings from the apartment he had been staying in and as usual, it was an adventure that I just can't wait to share! We went on Veteran's Day because the place that Jim is working had the day off. We started out about 8:15 and Jim dropped me at the train station while he parked so that I could get the train tickets. Okay, I admit it, I am vain! Without my glasses I just cannot read those stinking tables that give you the number of the stations--each station has a number. Harriman where we started is 793 and Penn is 000. I finally figured out the numbers for the stations (Harriman to New York Penn Station--not just Penn Station I found when trying to find the stupid station number!) and put in my credit card to pay and card reading error! Oh just ducky! 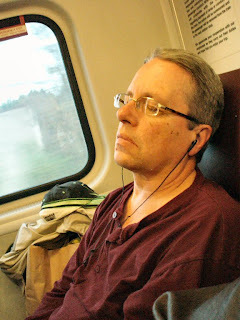 So, with the train pulling in and Jim breathing down my neck, I slammed it in again and Voila! It read the card and was authorizing. The conductor asked if we were boarding and Jim told him we were waiting for the tickets. The conductor said no problem they would hold the train if we were about done. The conductor said that if it wouldn't take the card, we could buy it on the train--great! NOW you tell me! The conductor asked what was happening and it finally started printing the tickets and spewing them out! Thank goodness! Grabbed those puppies and we bounded onto the train! There were a lot of people heading into the city. Some were going to work and some were going for the Veteran's Day parade--the oldest in the country. It is a big parade and Jim said there were trucks all over the place the day before when he was on his way home. This time I had a better idea of the trip and was ready for all of those fun changeovers. We did not miss any trains and when we arrived at Secaucas to transfer to the Penn Station train, we were serenaded by a trio which was a violin, guitar and bongo drums. Sounds weird to explain, but they sounded great! You can't see them very well in this picture, but they are next to the flowers in front of the big mural. So nice in the morning! Jim said that this happens all the time. Cool! When we got down to the track, there was a guy with a keyboard who was singing. He was very good! During the subway trip, there was a lady and two young Asian girls--okay, the girls were about college age. The lady kept up a conversation, telling the girls what was at each of the stops. I noticed along the way that she was wearing a button that read "New York City Greeter", so of course, I listened in. At each station she had something really interesting to say. For instance, one of the stops was Borough Hall. Well, each of the Boroughs have a Hall--like our county courthouses. Never even considered that! There is also a prominade where you can get magnificent pictures of the New York skyline. Didn't know that either! 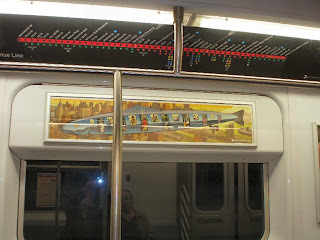 Also in our car was a very interesting painting of a futuristic subway car--at least I think it is. I suppose there could be many interpretations on this theme. You take a look and see what you think! I am sure there is some really deep meaning that the artist was trying to say, but I look at art kind of like the picture--I just float over it and enjoy. :) At least it is something to look at and think about on the subway trip--though I really enjoy the people watching part. This time, there was a lady crocheting something that looked to be a mitten. Someone is getting a Christmas present I bet! From the subway to the apartment are a lot of row houses and apartments. They all have iron security grates on windows, doors and gates around the house. Some of the work is very pretty and well-kept. I intended to take pics of that on the way back, but we came back a different way, so not this time I am afraid. It took us 3 1/2 hours, but we got to the apartment and I got to meet Jorge. 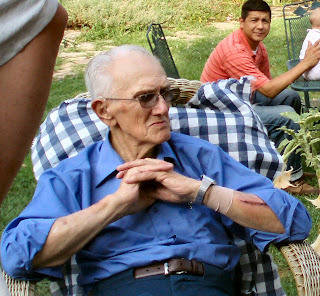 His wife's name is Yvette and they are from Costa Rica where they have a farm which she runs in his absence while he is working up here at the same place Jim is working. Jorge is a very nice guy and he and Yvette plan to come up to Florida in the spring to see the camper and the area around here. They are the ones who had the accident in our van. I look forward to meeting Yvette. Hey! Our names are of the same root, so I have to meet another of me! :) We put Jim's stuff into the two suitcases that we brought for that purpose. One of the things that was there were my jumper cables that had been in the van! Yay! I have been looking for those! :) Then, it was off to the subway to head back. You look one way down the tracks and there are white lights. Then, you look the other way and the lights are blue. As I was looking down on the track, Fivel and his family were very active. They would head down the track and interestingly, they would sit until the cars went past and then scurry across to wherever they are heading. I found that amazing! 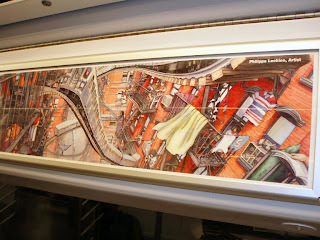 This is the picture in our subway car this time. It really reminds me of some posters that my son has hanging in his house where the stairways go up and down, but seem to always be rightside up and yet at the same time, upside down! In fact, there is a comercial on SyFy that uses the same imagery. In this case, it is a subway going all over! We wanted to get to Penn Station with enough time to eat before we left on the 1:05 back. 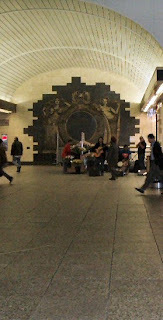 I should say here that in a previous post, I talked about the mosaics in the subways and the workmanship. I took a better picture of the mosaic this time so that you can see all of the work that went into all of the subways! Can you imagine! I bow to their work! Thank you! 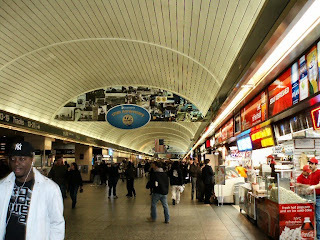 Here is the New York Penn Station. There is everything imaginable in here--including a K-Mart complete with pharmacy that was advertising flu shots! How about that? One of the things that I really like is that there is an abundance of places that sell those huge pretzels with mustard! Gosh! I LOVE those things! I can't eat much of them--just a few bites, but they are ambrosia! One of my favorite things from NYC! I had been looking forward to one from the moment I knew we were coming up here. So, having had my fix, we headed down to the tracks for the train and boarded the train to Secaucas. This train was a double decker. Jim and I found a seat on the bottom--easier to get to with full suitcases--and my phone rang. It was the insurance adjuster letting us know that the van is indeed a total loss and we spoke about all of the items that were needed to resolve everything with our insurance company who will then go after the insurance company of the guy who was driving under the influence that ran into our van. His insurance company was not really willing to work with us directly to resolve the damage, so our insurance company is doing the fighting for us. It's possible that since that guy totalled 3 vehicles plus his own and sent a bunch of people to the hospital, including himself and took out a light pole to boot, that his insurance limits may be reached or very close. At any rate, we no longer have a van. There is a picture of the van in the previous NYC post if you want a peek. 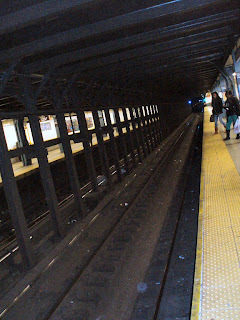 We had an uneventful trip to Secaucas and boarded the train to Harriman Station which is our home station. We are just going down the track when BANG! Scrape, crunch, crunch, scrape! We were sitting in the last car of the train and what did I do? I grabbed my camera and ran for the rear of the train as it was abruptly stopping. I am NOT gonna miss whatever this was! Do you know what it sounds like when a train and a car collide? I do! 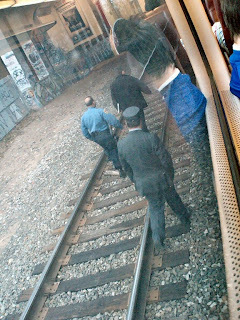 Okay, so the car actually hit the train--at our car--the last one on the train! I'm talking to the conductor at the back of the train and he saw the woman running from the car and confirmed that no one was in the car. 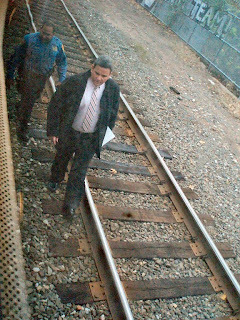 The car was down around the corner on the track--it takes a long way for a train to stop. The engineer walked back to the crossing to check out the wreck and speak to the police and to meet with the safety officials. I went back up to tell Jim what happened--we hit a car--a car hit us--and the lady in the seat in front of us was on the verge of hysteria. Are they sure it was a car? Could it have been a deer? How do they know no one was in the car? How do they know this car is safe for us to sit in? They can't check it out thoroughly! We could be in danger! Blah Blah Blah! I listened to her and told her I was going back to speak with the conductor to be sure no one was injured and she might just have a point about the safety of the railcar. It does no good to argue with someone in that state of mind. So, I went to the rear of the car where all of the other crazies were hanging--one of whom heard the comment that the lady made about a deer. He laughed and said, "That would be one TROPHY BUCK!" LOL Okay--that really WAS funny! This was a rare time when the door was open to the conductor's area and even his actual seat area so we got to see all of the rear controls and listen to the radio transmissions between the engineer and other emergency workers. 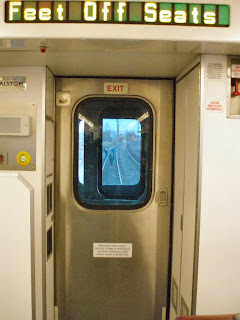 Usually, especially since 911, there are two steel doors between the conductor and the passengers and you can't get in there. As I sauntered back, I asked the conductor if he can open his window and hang out. All went very quiet as everyone thought that was a weird question. Okay--it was. 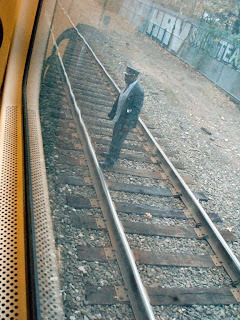 I explained that I wanted him to take a picture of the damage on the rail car for me. He opened his window and looked out--but alas, there was no damage to see on the train car and they had already pulled the parts of the car out from under the train car. 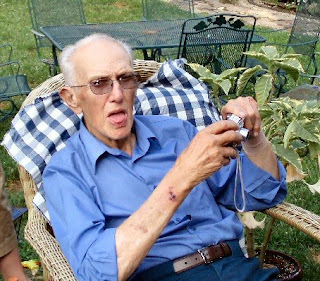 He said he would be happy to take a picture if there was anything to take a picture of, but nada. That was nice of him though. One of the guys said "No arms or anything? Gosh!" I looked around and said, "Well, I hope you know I am gonna blog THIS!" Everyone laughed and went back to making macabre jokes and passing the time while listening to the radio and trying to get a look at something interesting. I took a break and went back up to let Jim and the hysterical woman what we knew. 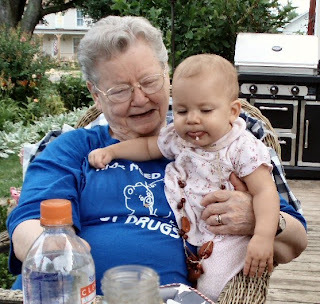 I talked to her and listened to her concerns and she began to calm down. I noticed a woman across from us who asked me what happened. I told her that a car hit the train. She could not believe it! This was the SECOND time she was riding a train that hit a car! I asked if she had some sort of magnetic force that drew them to her! She said she was not sure, but was tired of waiting on tracks! It turns out that especially in the morning, cars wait at the tracks and as the train comes around a blind corner, they car scoots onto the track to commit suicide. Many crossings actually have police cars there in the mornings just to keep that from happening! Sheesh! Okay, REALLY???!!!!! So, I started watching people--as I like to do. A quartet was riding in the front of the car and started singing Mr. Sandman softly. I yelled "Louder" and they started singing louder. They were really good! About 45 minutes later, who do I spy coming down the track, but the engineer. Yay! This means we are closer to moving! He began looking at the damage from the rear and worked his way forward. 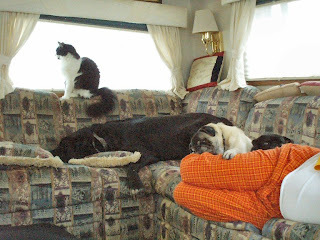 So, here we are today as we hybernate inside the RV on Saturday, November 14. 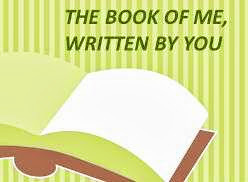 As I write this we are staying out of the rain from hurricane Ida. We started the day at Dunkin Donuts and then went to the grocery store and hoofed it back to the RV where I started a pot of Denver Bean Soup in the crock pot. We hunkered down to watch the Nationwide race and watched Kyle Busch pout once again! It rained all night and all day today. Ida is causing coastal flooding and uh, what they are calling strong winds. Okay folks. 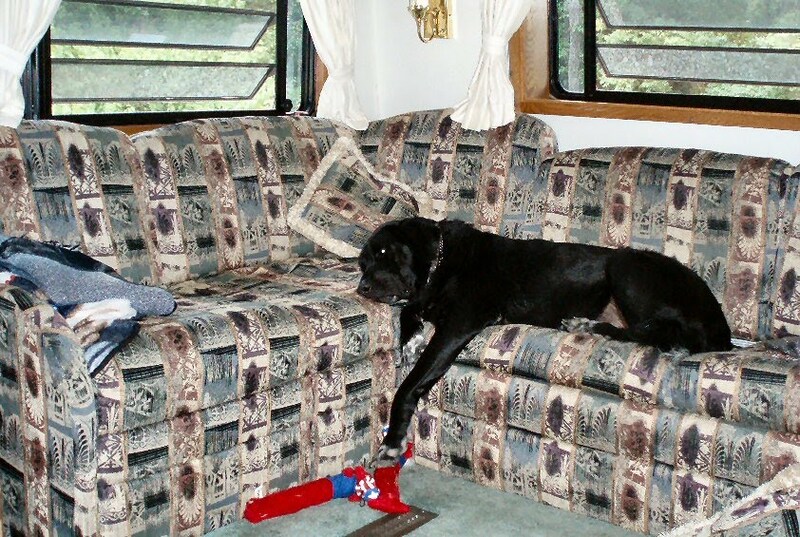 These breezes are not even moving the RV! This is a breeze not even worthy of mention in KS! But, NY is not KS, so it is worthy of mention here. So, until next time, everyone stay safe and be sure to check back for more of our adventures! 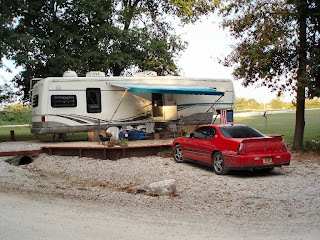 So, going back to Missouri and Kansas...the camper was parked at our good friend's house--Orville and Marcine Gorman. They were kind enough to allow us to park it out on their acreage while we loaded and got ready to go. We sorted and drove stuff the 8 miles to the camper and loaded in. It is really surprising what will fit in those storage spaces in the camper! Wish they would make houses with that kind of storage! I also had 3 garage sales--or as I called them "If it doesn't fit in the RV, it's gotta go" sales! :) Through those sales, I got to know some really great people in Augusta that I had not met before but wish I had! 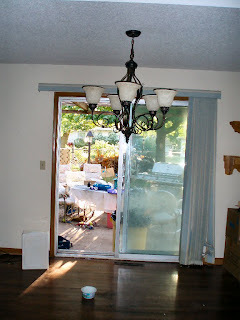 Several could not believe all of that stuff actually came out of the house--well it did! I had a serious amount of, uh, stuff! Yikes! Can't believe that I had all of that! I really thought that I would have many crying sessions as I parted with my stuff, but in actuality, and unexpectedly, the more I sold, the more I wanted to sell! Crazy for a pack rat like me! :) It was quite literally kicking my patootie--all the work, heat, humidity, yada yada... I should mention here that Ashley's parents and sister came over to lend a hand as well! Her dad showed up with a truck load of tables, signs and flags and set about setting up a real sale! And we ladies loaded all of the tables down each time! Many thanks to them!!!!!! Tom and Nina came down and hooked up to the camper and off we all went to the Kan-Do Kampground in Montgomery City (I-70 Danville exit) Missouri on September 4--just before Labor Day. You know, I had been searching around the area that my parents and brother & sister-in-law live and called Kathy about availability. There are a bunch of pipeline workers in the area that were taking up most of the available spots in the area. She said that she would find a spot, or make a new one for us! How wonderful! AND, she is a big dog person--having owned Saint Bernards until last year when her last one died. Dog people can just communicate! :) She had a wonderful spot all ready for us. It was spot number 1. Cool! I was following the camper as we went and about 20 miles from the campground (or in the case of Kan-Do, the Kampground ;) ), something flies off of my camper and hits the road, sliding off onto the shoulder. I pulled up alongside the camper to see what was missing and a door had flown off. No, not the people door--a door to what I would later learn is the water heater vent. 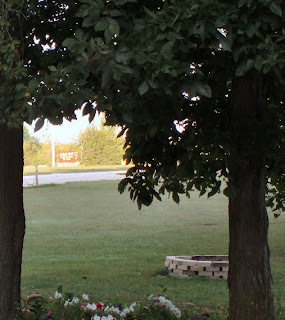 I called Tom and told him that the door flew off and I knew where it was--just past the bridge between the livestock yards and the Apple Wagon Antique Mall. You know I always notice Antique Malls! Love them! (this picture is actually as it looks in NY with our two 100 lb propane tanks attached and ready for action!) They went on with the camper and I turned around to get the door. This is an area in which the exits are about 20 miles+ apart, so it took me a while. I found the door in good shape, as it had not been run over and the screen, grabbed them and was off to catch up with the camper. 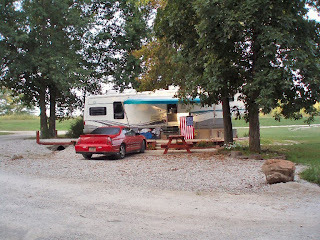 Tom and Nina got to the campground where my mom and dad waited with a bucket of Kentucky Fried Chicken, mashed potatoes and gravy, slaw and chocolate cake! Yummy! :) Tom had the camper leveled and ready by the time I arrived and we all sat down to eat. Then, we started looking for all of the hookups--electric was already plugged in, needed a water hose and we found the sewer hose and attached it. Since my parents had campers as we were growing up--that got bigger and nicer when the kids left! hmmmm...--I had some great pointers from them. I had all of my breakables wrapped in my towels in the bathtub and sink and everything else was stowed for the move. It all arrived in great shape--I feel due to the excellent driving skills of my brother, who drives a semi for a living. No breakage whatsoever! We took a look at the door and aside from a black mark where it hit a tire on the way down, (see it in the picture?) it was in good shape. The grill that I picked up was the wrong one. It turned out to be the cover for a speaker. Ah well. I knew where the door had flown off, so I was willing to look again for the correct cover. Turned out that the door was held on by a plastic piece that you put through a slit in the door and then turn. It must have bounced open when we hit the bump after the bridge. I have now fixed that problem by putting a carabiner on that little piece so that even if it does flip on it's side again, it will not be able to slip through the slit in the door! We visited a camper place in Montgomery City called Cunos where we got the water hose and I was able to look at the door on another camper, so I now knew what the grill looked like for that door. 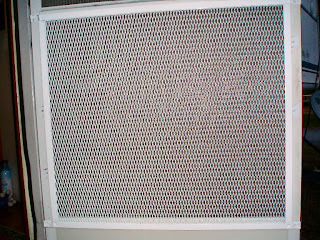 We were told that some people when they have lost that grill cover have found that they can use those metal mesh screens that people use on screen doors to keep kids and pets from running through the screens and knocking holes in them. Tom needed to go to Columbia, MO the next day, so I rode along and we hit Menards. Never having visited a Menards before, this was a new experience and what a store! Have I told you that I LOVE lumber yards and tool places--Home Depot, Lowes--You know!? Yep! I do! So, I was entranced with this store! It is HUGE and right next to the Bass Pro Shop. 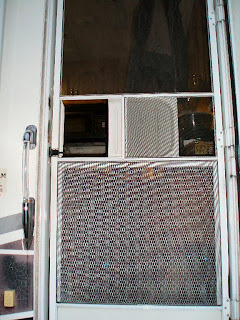 Hmmm... We found the metal screen covers and they looked about right for the door to the camper. As I thought about our little varmits, who were already scratching at the door but had not made holes in the screen yet, I thought great! Tom cut off the tabs and fastened it to the camper door. Now the dogs can't damage the screen and are safe and secure inside! What a great serendipitous thing! See them lined up and looking out the door? Look closely! On the way home from Columbia, Tom drove along the shoulder of the highway where the door came off and I spotted the screen, jumped out and snagged it. It was a little worse for the trip across the pavement, but Tom was able to straighten it out and it works just fine now! 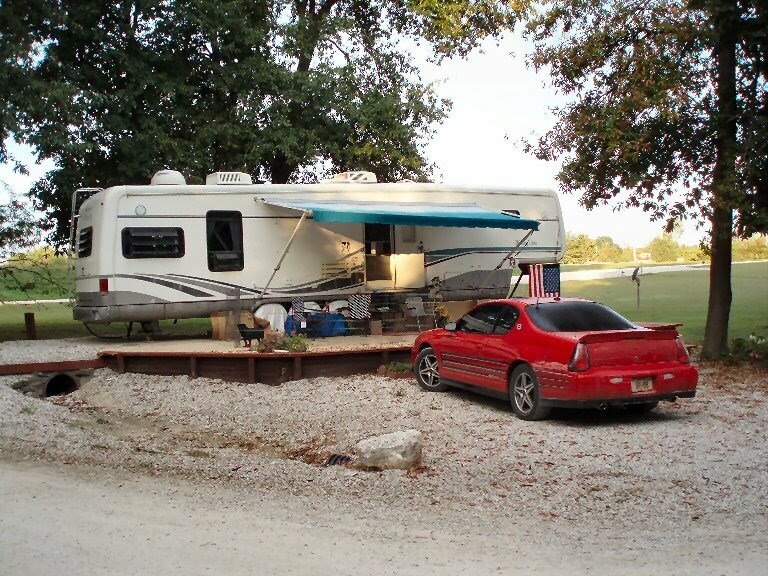 Here is our first lot in Kan-Do Kampground in Missouri: In the first picture, Junior is hogging the shot and not letting you see the bottom level of this lovely camping spot. The bottom level has the picnic table. It is a very nice spot. Cement and everything! Wow! With the awning out, it is a wonderful place to sit in the mornings and drink coffee and just listen to the rustling of the wildlife in the woods across the road as they are stirring. The first several days there, I just wanted to take a nap and was tired all the time. I wondered if I was getting sick or something. On the third day, I woke up and felt great! Guess I just needed the rest! I found that I really loved living in the camper and enjoying the trees and wildlife around me. 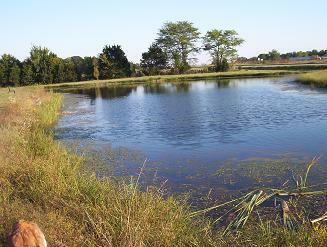 It is peaceful and tranquil at Kan-Do. I also got to walk the dogs several times per day for exercise! On Sept 11, James, Ashley and Jim arrived for a golf tournament. James, Jim, Tom and my nephew, Seth (married to my niece Dana) golfed together and had a great time! Ash, Nina and I put the top down on Nina's convertible and headed to wine country gardens and the winery tour. The leaves were coloring around the wineries and how pretty! Ash said that she didn't realize before how pretty Missouri was! We met up with the guys and mom and dad and went to Stone Hill Winery where we ate in the barn--yes, the barn--for James' birthday. Yummy! Good German food as well as steaks and seafood and we all had a nice time! It was great to have James and Ashley with us. Kids get so much fun as they age and I have had a wonderful time getting to know James and Ashley as adults instead of kids. I am very proud of the man that James is. Then it was back to Kansas for the estate sale. This one was in the house and I sold everything in there except about 6 pieces of furniture. There was no way I was going to get rid of the family heirlooms. It really helped that Ashley wanted my desk (which took me 3 years to find!) and Tom wanted the display case (actually a humidor) and Heather and Matt (niece and her husband) wanted another of my special pieces. This helped--knowing that those were going to good homes! I also put the tile in the bath (that I had purchased for it when we bought the house in Dec. 2007 but never got put in until we were ready to sell it--of course!) and new faucet for the bath. It looks so good! Wow! Take a look! 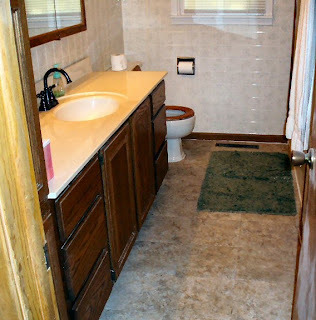 The before had the older faucet and carpet (no comment on carpet in bathrooms!). When I tore up the carpet, it had old tile that was dark gray! It sucked the light and life right out of the room! So, I really loved the way it turned out! Just the way I had envisioned it when I got the tile in 2007! Yesterday, Jim and I took off for New York City to retrieve his possessions from the apartment he has been staying in. Perhaps I should back up here... We moved the camper to Montgomery City, MO on Sept 4 for the "shake down" camp to be sure that everything worked and to be near the family if it didn't--also for good advice from the family even if it did! 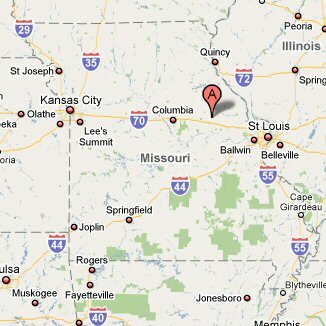 I will catch you up on the Missouri adventures in a later post--and there WERE some! Anyway, we pulled out of Missouri on October 26, 2009 and headed for Florida. Oh, Florida, New York that is! In the Hudson Valley of New York. More on THAT adventure later too! And what an adventure! Wow! Yikes! Direct TV was supposed to come yesterday between 8 am & noon to find the signal which seems to be eluding me here. After that, Jim and I were leaving to head to NYC (actually Brooklyn) to get his stuff. The Direct TV guy had not shown by 12:30 so I called Direct TV and was told that the technician would contact me within 20-30 min. By 1:30, we decided that we had to get on the road to catch the 2:30 train to Secaucus, so I called Direct TV and rescheduled for Thurs. Ack! 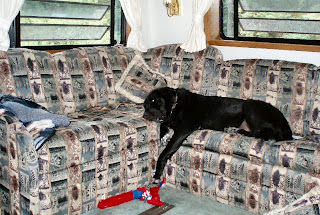 Let me just say here that most RVers have Dish because Dish LOVES RVers and is very RV friendly. However, when we bought the RV we found that the integrated dish was set for Direct TV so decided to keep it rather than manually reset the Weingard for Dish. BIG MISTAKE!!!! Direct TV is not RV friendly and we have not had a good relationship so far. When our 2 year contract is up, we are switching to Dish--who caters to the RV crowd. 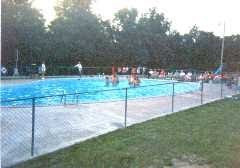 So, we head for Harriman to catch the train which will take us to Secaucus where we can switch to the train that will take us to Penn Station where we can catch the subway to Brooklyn and the apartment. The train was smooth and quiet. 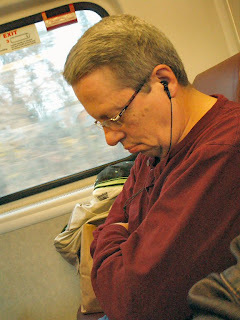 I cannot believe how quiet people are on the train. 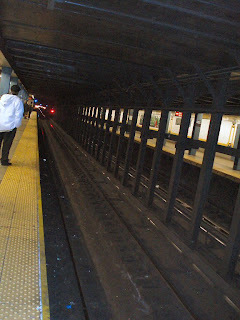 The subways are the same! They are amazingly clean given the number of people who use them each day! Some stations are nicer than others, but all seem okay. Peope are in their own little worlds and either read, do puzzles or sleep--or in Jim's case--have MP3's with books or music on them. I, on the other hand, decided to play tourist and look around like a silly kid--seeing what was to be seen. As we traveled, there were really nice big homes. Those gave way to smaller homes and then row houses and then a few junk yards and stores mixed with some light industrial type places. 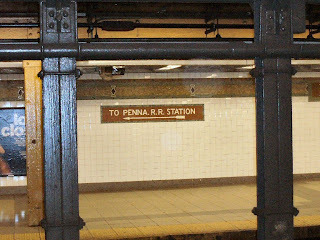 So, we go back to B track and I look a the board which indicates that the next train to Penn is leaving from Track 2. So, we head back up the steps and back down to Track 2 where a train came blasting through with a huge Whoosh! Jim said "that's the free train if you can catch it" to laughter from those around us who were waiting as well! We could look out at the Hoboken Skyline. There is a building there that looks a great deal like the empire state building and it made me wonder if the same architect designed one for Hoboken? On to Penn Station. 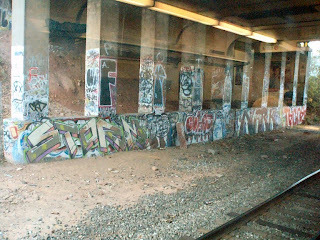 The ride there went from light industrial to industrial to run down areas with a lot of graffitti. It made me wonder what kinds of things the engineers might see as they are going through during the day and nights. 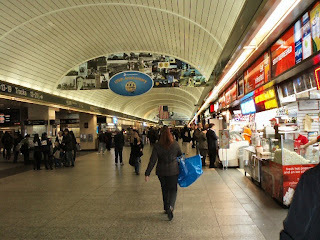 We arrived at Penn Station and I had to admire the mosaic tile work! Someone back in the days that the station was built really put a lot of craftsmanship into those mosaics and I had to admire them and the work hours that went into them. I'm glad that they have been preserved through the years! All of these pictures were made with little 1 inch tiles. You can see how some are smaller and some are quite large, but all are worth a gander at the work put into them! Got to Brooklyn and headed for the lot where the van was parked. Jim had loaned it to the guy he was renting a room from while the guy's family and some friends were visiting from Costa Rica. Some guy was at a gas station and became enraged. He rammed the vehicle in front of him, put his car in reverse and rammed the car behind him, put his car in drive and rammed the front car again, hit a light pole, zoomed out onto a one way street--going the wrong way--and found our van hitting it hard enough that his car ended up facing 90 degrees from where he started! This guy was really out of control! So, this is what we found: Yikes! Poor van! It even turned the passenger back tire in and the one on the driver's side out! Arf! We loaded up the suitcases and a couple of shopping bags with most of Jim's stuff and headed back the way we had come. 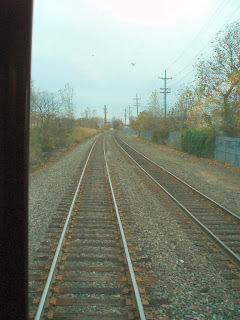 Dad had said that we should get into the front of the subway car next to the engineer (not possible to sit next to the engineer anymore) so we got into the front car where I could stand and look out the front window and see what there was to see going down the tracks. Interesting! 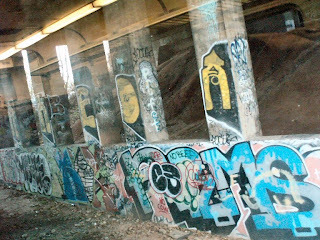 There is definitely life down the tunnels as there is graffitti along the walls etc. We got off the subway and thought we were heading to Penn Station only to find that we had been belched up onto 34th street. Being a woman, I asked directions from a street vendor. That way he pointed--English not being his first language--or really not in his vocab. We arrived at Madison Square Garden (which was cool!) and a large sign for Penn Station, and headed down to the trains and back on the right way, arriving at the RV 8 hours after we started the trip. There were 3 dogs that were really happy to see us! What a day! I wanna go back so that we can stop at Wall Street and take pics! And maybe some other places. Who knows? Not today though!